The Very First Plan With Me! 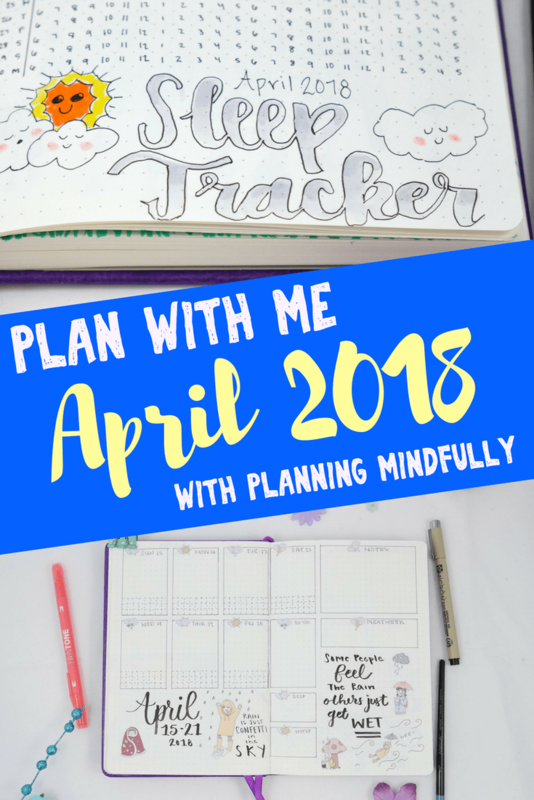 I just want to welcome you to Planning Mindfully’s first Plan With Me for April 2018! If you want to know why I started a ‘Plan With Me’ series, you can check out the introductory post here and learn more about it! Regardless, I’m very excited to share with you my set up for April! It is truly an honor to have you be involved. We have a lot to go over in a short amount of time, so let’s get started! 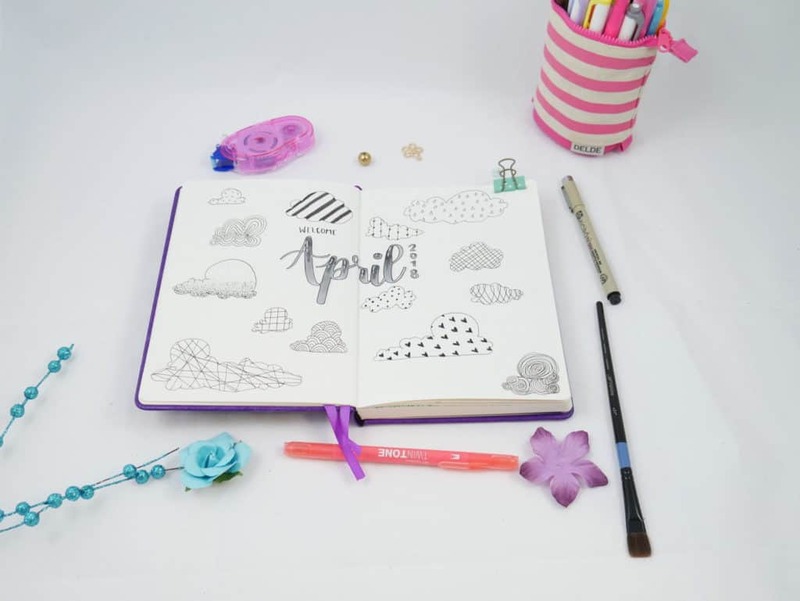 April 2018 marks my 19th month of bullet journals! I’m excited to say that I’ve now transitioned to bullet journal number four. I had a lot of fun setting up for this new bullet journal because it’s been pretty hectic with a new work project. I enjoy any opportunity I can to be creative because it’s very relaxing for me. The notebook used for my April 2018 bullet journal spreads is the A5 Dot Grid Scrivwell Notebook. This is actually my very first time using a notebook from this brand; the owner and I collaborated on Instagram and she was super kind enough to send me a few notebooks to try! I’ve been very impressed so far. It’s worth noting if you are looking for a hardcover dot-grid notebook style that’s a little less expensive than most, you’ll definitely want to look into the Scrivwell brand! If you don’t know much about my process, each month I select a bullet journal theme. Having a theme ties my whole month together while still allowing me to try some different decorating techniques between my weekly and monthly spreads. I’m actually a huge fan of weather and have been looking forward to this particular theme in my April setup. As a child, I would literally watch the weather channel for hours. In an alternative universe, I’m relatively sure that I’m a meteorologist! I take advantage of using different types of doodles, some of which are on Pinterest, and others on Google. 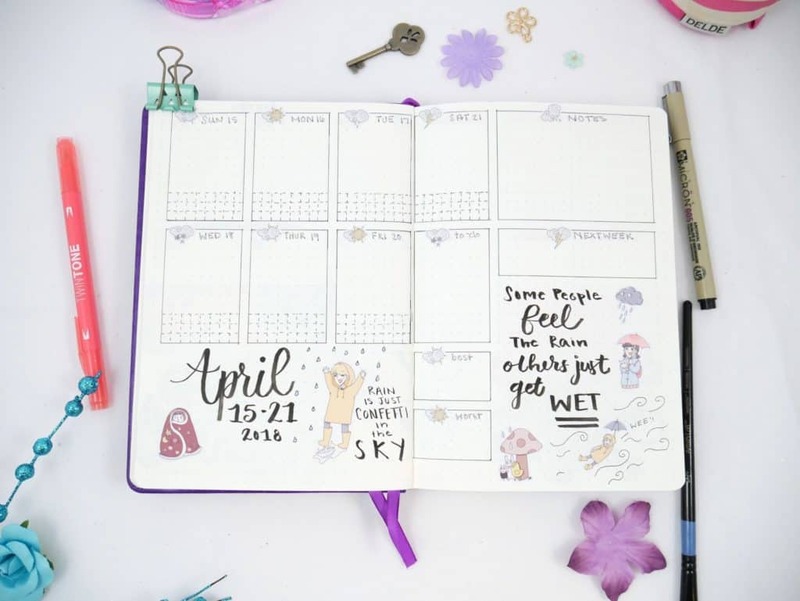 If you’d like to see the source of my inspiration for my Plan with Me for April, make sure to check out my ‘Planner Doodles‘ board on Pinterest! Weather is such a vast topic, thus I drew many different types of weather doodles. In the past, I always created one-page cover pages for my bullet journal spreads. And while this is a worthwhile option, I spent much of my third bullet journal working toward optimizing my layouts so I could utilize my spreads for more drawing and creativity. So for April 2018, I decided to try a two-page cover page instead! In my home state, April is known for being a very cloudy and rainy month! Thus, the beautiful gray clouds are an homage to our weather. The best part of clouds is that there is no ‘right’ way to draw them, especially as doodles! 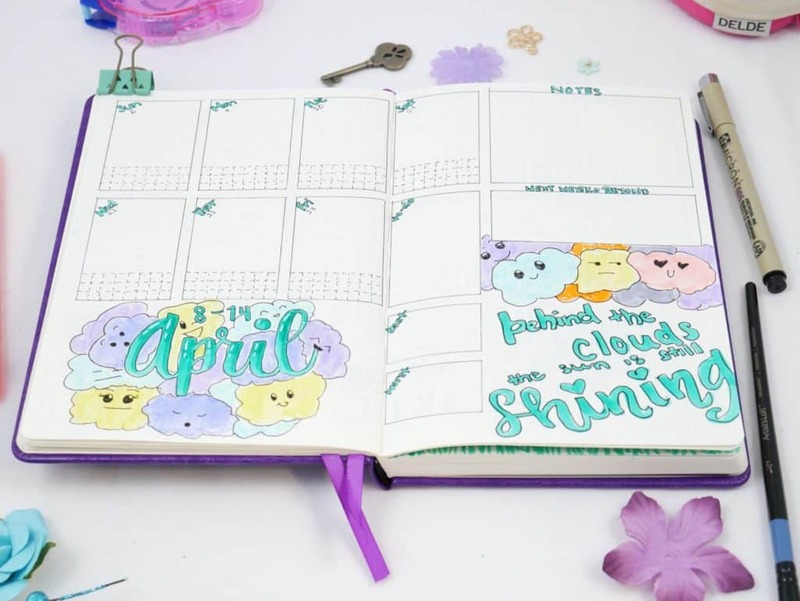 The patterns were a fun way to give the clouds personality while keeping them cute and fun. Because April is literally such a busy month, I chose to make my monthly calendar as simple as possible. To stick with the weather theme, I chose to decorate my monthly calendar with rainbows! I always feel like there’s more space than I need for the side of most of my monthly calendars, thus I tried something different by creating my header on the side instead of the top! The boxes for each day are 6 x 6 in size. The boxes for the days of the week are 6 x 2. I love making habit trackers! Over the last few months, I transitioned to a two-page layout for my habit trackers. The one-page layout is a bit squashed and often had no extra space to create pretty doodles around it. The whole concept of the habit tracker revolves around whether I did or did not do something over the course of the month. The habit tracker differs from my goal tracker in that I’m not necessarily trying to fill in all the boxes. At the end of each month, I compare my habit tracker to my mood tracker to see if there is anything I need to adjust in my daily functioning. I love AmandaRachDoodles on Instagram and the snowflakes are inspired by her December 2017 pages in her bullet journal. The entire box is 30 x 24 dots, and the label lines are 8 dots long. The dots for the dot grid serve as a way to separate each box and habit. It takes a lot of time to draw out all the lines, so it’s nice to not have to draw every single line to separate the boxes. After months of trying to play with my Moxiedori circle tracker stencil, I finally figured out how to incorporate my mood and goals in the same circle. 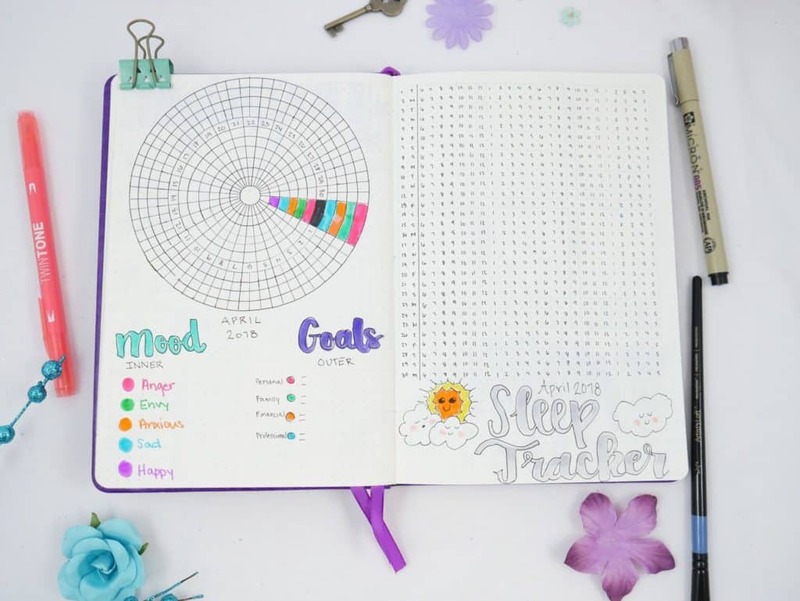 It was so irritating when I had to draw two circles because I didn’t have the space to write out my goals next to the trackers! I bet it looks a little confusing to see two trackers in one circle, so here is how I break down the two different subjects. 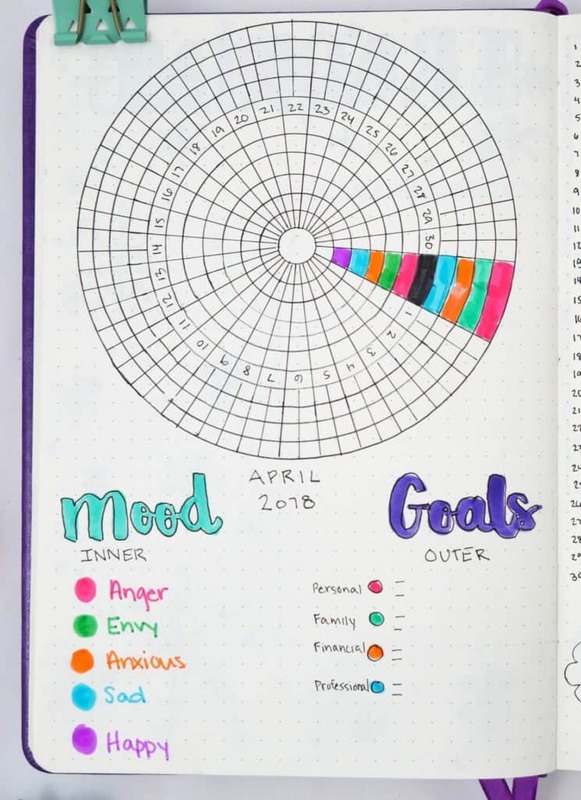 I separated the trackers into two sections; the mood tracker is in the inner circle and the goal tracker is in the outer circle. The circle with the days of the month is the separation between each tracker. For the mood trackers, you’ll see the colors I use to track each mood on the lower left of the page. I rate mood by intensity; I do not like to define each day to have a specific mood because I have a lot of different moods throughout the day! So the lighter the color on any given day means the mood is less intense; likewise, if the color is darker and vibrant, the mood is more intense. I tried rating with numbers in the past; I felt like that was pretty difficult as well. The goal tracker was a little trickier to implement as I’ve always liked to have more than one way to reach a goal throughout the day. I create goals on four different planes; personal, family, financial, and professional. I found a way to create two boxes for each type of goal every day instead of just one box by using a ruler to separate each daily section in half! It wasn’t a perfect art, but it got the job done! This layout for sleep trackers has been one of my favorites. It takes a little longer to set up, but by creating this structure, it’s way easier to track my daily sleep as a whole throughout the month. 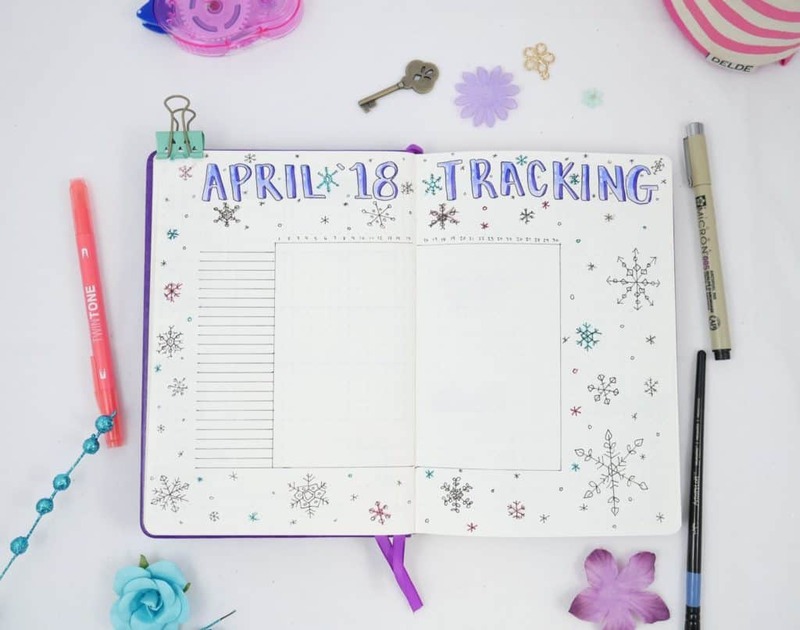 Much like the habit tracker, the dots make it easy to label the boxes without having to draw a ton of different lines. I love the little sleeping clouds and the sun trying to wake them up! For the most part, I try to keep a relatively consistent layout structure for each weekly layout of the month. Sometimes careless errors prevent me from keeping each layout exactly the same (sometimes I’ll forget to draw a box, or I’ll write the wrong thing in another box), but for the most part, they are pretty similar. For Week 1, I went with a zentangle cloud and rain theme. In Week 2, I went with a ‘Cute Clouds’ theme. For Week 3, I went with an ‘Outside in the Rain’ theme; this was especially fun to create! I used these Rainy Day Decoration stickers from ‘paperkumaco‘ on Etsy and they were literally perfect for this! 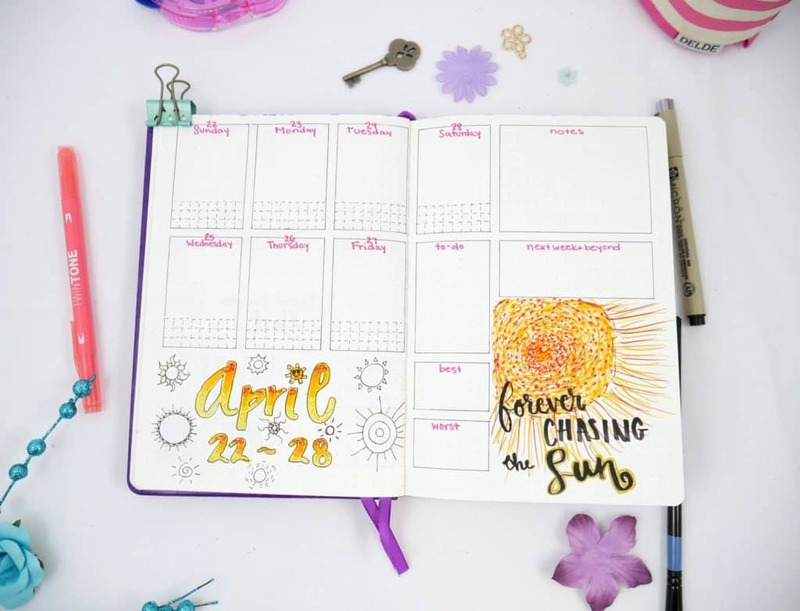 The last week of April, I went with a Sun theme! Well, this is what my monthly review looks like for the month of April! Something I always like to do for my monthly reviews is to find a way to tie together the themes of the current month and next month. Any idea what the theme for May will be? I can’t really go into a lot of detail over my month in review for April because, well, April hasn’t even started yet! 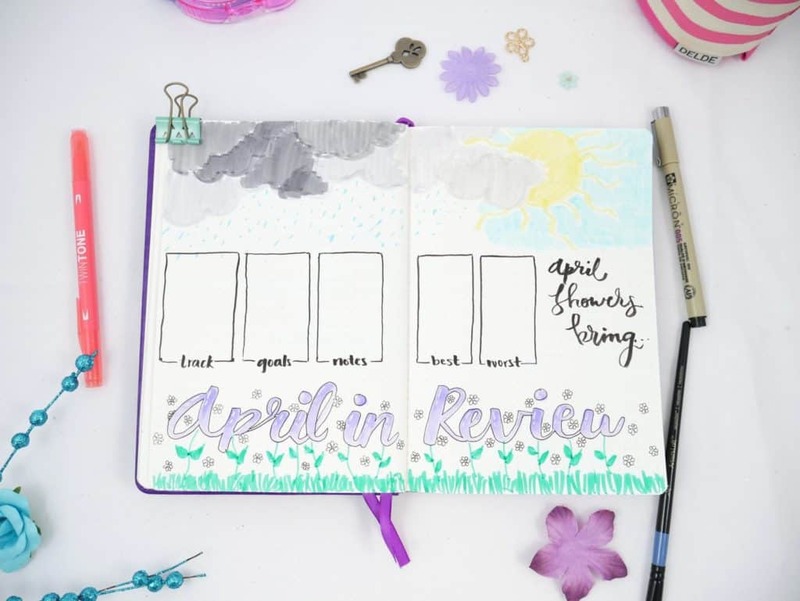 But one of the things I want to do with the Plan with Me series is to take some time to review the monthly review… just from the previous month instead! Going through the previous monthly review is how I make the adjustments necessary for the current month. I don’t want to create options that always waste time, or make layouts that I don’t use. It’s also an opportunity to review goals, habits, moods, and more. 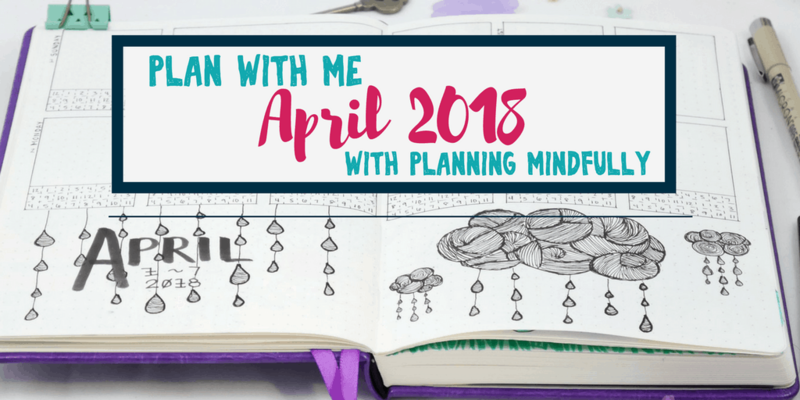 While this spot will be more valuable to you as I do more ‘Plan with Me’ posts in the future, you should at least get to know my process and what I learned from my bullet journal in March 2018. March 2018 was my very last month in Bullet Journal #3. And I’ve always noticed something interesting when it comes to the last month of any bullet journal. It’s literally like I completely forget to update the thing. 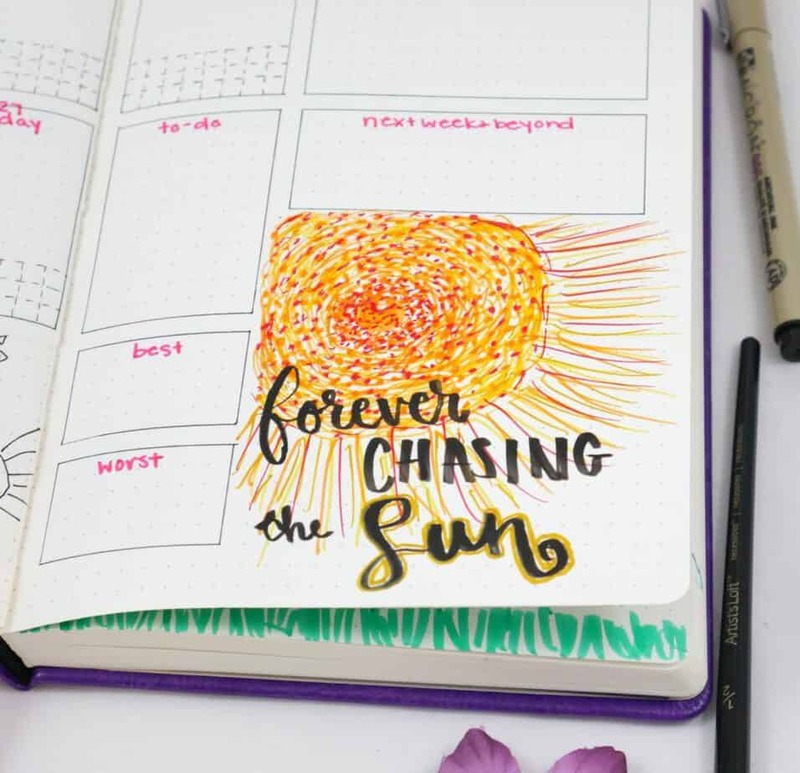 I don’t know if it’s because that month in my bullet journal just happens to be naturally busy, or because I’m so busy setting up for the next bullet journal entirely that I just space. 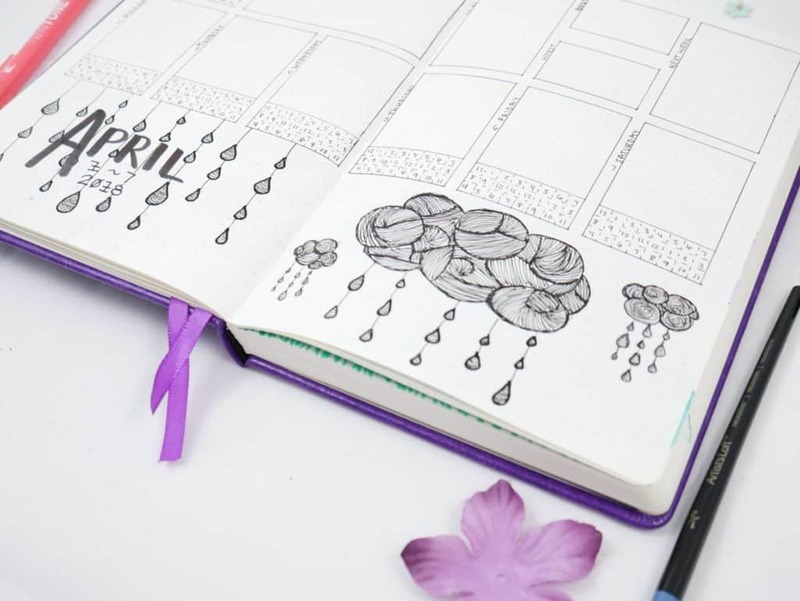 I think this year when I get to the second of the last month in my bullet journal, I need to set up that month and the last month at the same time so I don’t forget to use it! March 2018 was also the beginning a new and complicated project at my full-time job. I’ve been working overtime and weekends, which isn’t normal. I’m beyond exhausted and my time is more limited than ever. Thus for April’s spreads, I tried to do whatever I could to simplify my layouts. I’ll likely have to do the same for May 2018. My project ends in May, so I hope after that I can get my spare time and energy back. My goals and habits haven’t changed tremendously. In March I pre-emptively simplified those areas because of the work project. Besides trying to find time to fill the trackers out, it’s relatively sustainable. See? 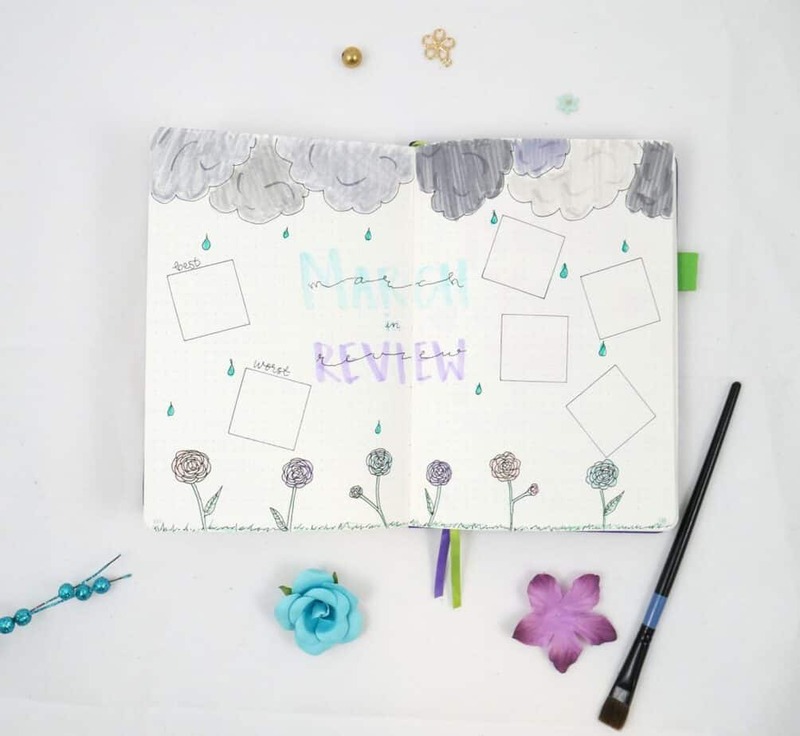 I consider myself a professional when it comes to bullet journals and planning… and I’m not perfect. It’s totally ok to forget sometimes, or even focus on real life. First, super excited that the Plan with Me series is now rolling! What I’m more excited about is that I would love for you to get involved in any way possible! If you are inspired by any of the spreads that I create and make them for yourself, I would love for you to share them with me! You can tag me on Instagram and Facebook, or even email me what you’re creating that’s inspired by the Plan with Me series! In the future, I hope to include your content in future Plan With Me blog posts, social media shares, and possibly even Youtube Videos! If you followed me on Instagram, you know that I love to share content with other bullet journalists! Not to mention, you get credit as well! Maybe even a surprise from me if your content blows me away! How Are You Planning for April? 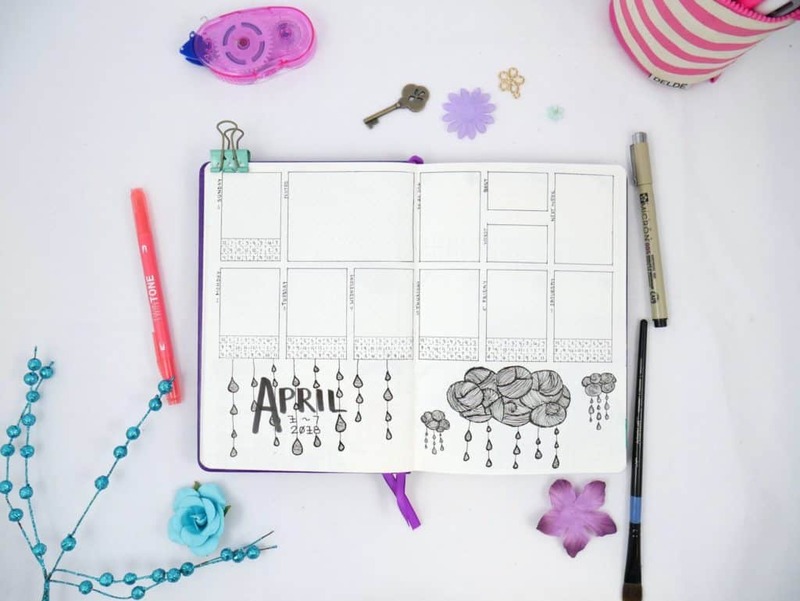 Tell me about what you’re setting up for April in your bullet journal or planner! I’d love to hear more in the comments. If you have any suggestions or recommendations for future ‘Plan with Me’ content, feel free to share through comments or reach out on my ‘Contact Me‘ page! Thanks so much for joining in on my Plan with Me for April! 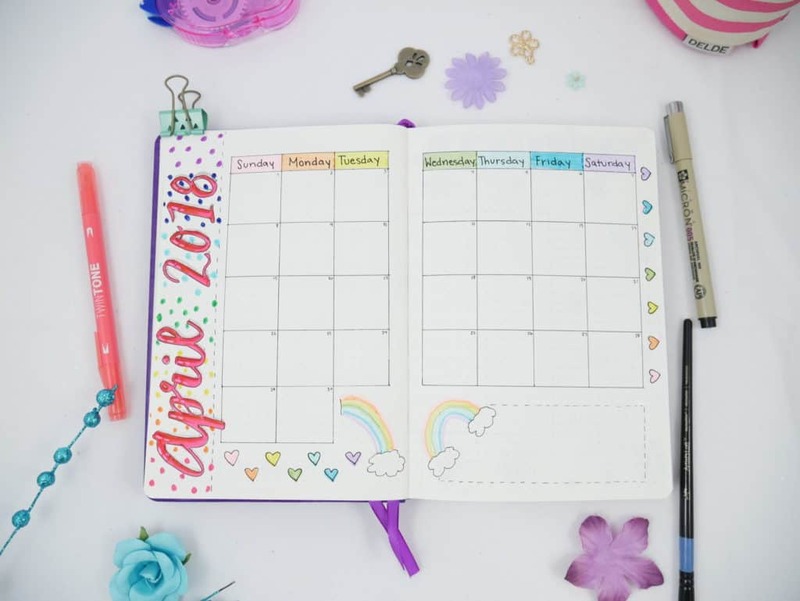 Did this inspire you to plan for April 2018?